China and Russia are looking into closer industrial cooperation, which could generate more value than bilateral trade, but nuclear cooperation is seen as unlikely as the two countries have been competing with each other in this sector. After Chinese President Xi Jinping and his Russian counterpart Vladimir Putin agreed to strengthen comprehensive strategic coordination on Sunday during the ninth BRICS Summit, Chinese Vice Premier Wang Yang arrived in Volgograd in southwest Russia to meet Russian Deputy Prime Minister Dmitry Rogozin on Monday. Wang will also attend intergovernmental negotiations and the Eastern Economic Forum, which runs from Wednesday to Thursday in Vladivostok, a city in Russia's Far East. "The agenda is cooperation in the nuclear, space and aircraft industries," Rogozin said in a Tweet posted on Saturday. The two countries have come to a new period of cooperation, as the bilateral trade volume cannot fully represent the potential of China-Russia ties, Ma Youjun, director of the Russia Institute at Heilongjiang Provincial Academy of Social Sciences, told the Global Times on Tuesday. Northeast China's Heilongjiang Province accounted for about 13.2 percent of the country's total trade volume with Russia in 2016. The China-Russia trade volume has been lagging behind the trade between China and the US, and also behind China-Japan trade, but the cooperation with Russia could extend into more sectors than trade, Ma noted. 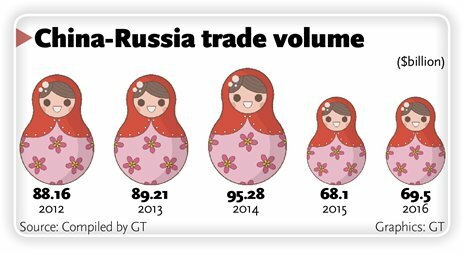 The bilateral trade between China and Russia reached $69.5 billion in 2016, up 2.2. percent year-on-year, according to the Chinese Ministry of Commerce. The China-US trade volume was seven times larger. "[The trade volume] has not met the expectations of the two leaders, and we have come to a turning point in terms of enhancing the two countries' economic ties," Ma said. Some Chinese provinces have been actively pushing forward industrial cooperation with Russia in recent years, including Heilongjiang. 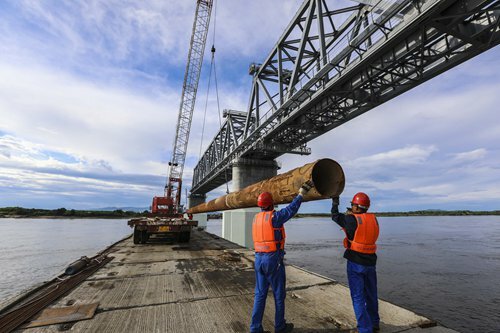 As of the end of 2016, the total investment from the province in Russia reached $10.61 billion, covering various industries such as mining, agriculture and forestry, according to a document the provincial department of commerce sent to the Global Times last month. China and Russia are also working to develop cross-border industrial parks. During Vice Premier Wang's visit to Russia, more deals are expected to be inked in the energy, space and aircraft sectors, media reports said Tuesday. The two countries are due to sign a mutual agreement on space exploration from 2018 to 2022, a spokesperson for Russia's official space agency was quoted as saying in a report by Russia Today on August 30. The cooperation in high-tech sectors will also generate more value for both sides, and some Russian companies have recently expressed their interest in enhancing business ties with their Chinese counterparts. For instance, Russia's high-tech conglomerate Rostec Corp is expected to ink a contract with Aviation Industry Corporation of China's Avicopter unit by the end of 2017 to jointly develop a civilian heavy lift helicopter, Xinhua reported on August 29. Also, both sides are working on a wide-body long-range aircraft and Rostec said the testing of its engine is scheduled for 2022 and its certification for 2025. In addition, nuclear cooperation is also possible, Shanghai-based news site thepaper.cn reported on Tuesday. Though Russia has been in a leading position in space and aircraft technologies for decades, China has been seen as a competitor in nuclear program development, Lin Boqiang, director of the China Center for Energy Economics Research at Xiamen University, told the Global Times on Tuesday. "There has been no project in a third country that has been jointly developed by China and Russia. We have been relying on EU and US technologies in building nuclear power plants," Lin said. "China and Russia should look into industries that are complementary. Russia has abundant resources and China has a huge market; that's how deals can be made," he noted. Russia and China have developed some major oil and natural gas projects in recent years. Chinese Vice Premier Zhang Gaoli also called for further research into the western route gas pipeline and the Far East gas supply projects in February, the Xinhua News Agency reported.